Practically Private, you'll travel with up to 3 others (maybe). If no one else books, this will be a private tour. Visit Mount Rainier National Park on this full-day tour. See waterfalls, old-growth forests, flowering meadows, and wildlife in their natural habitat. This experience on Mount Rainier makes your expected stops — but also ventures off the beaten path, with fantastic views and vistas, waterfalls, and park grounds. This tour travels all the way around Mount Rainier, and the different landscapes are fantastic. Three stops for trail walks and/or waterfalls are included. On this tour, travel via our comfortable SUV to Mount Rainier. Experience pristine, old-growth evergreen forests, sub-alpine meadows, waterfalls, an ice-glacier path, and spectacular alpine vistas. Stop at Longmire for a visit to the 1899 park headquarters. Walk along a nice dirt trail through the forest and visit the gift shop if you wish, when open. 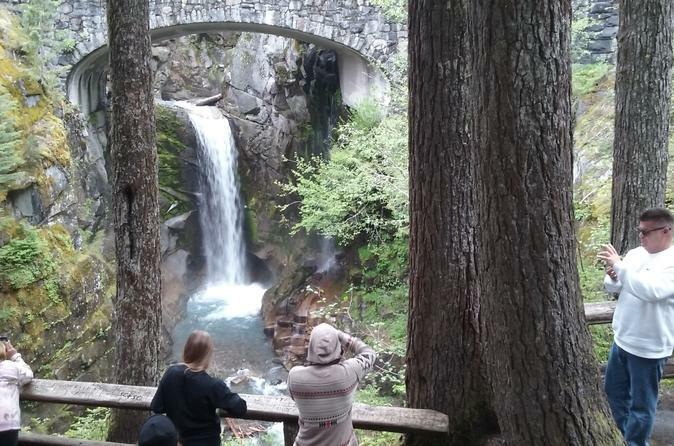 Then visit Paradise, located on the south slope of Mount Rainier, with personal time to hike the paved and dirt trails to a waterfall or vista with massive Mt. Rainier in front. There's also the visitor center, gift shop, and Paradise Inn Hotel to explore. You'll also stop at Narada Falls and Christine Falls, both right beside the road.